Here's a little insider knowledge, courtesy of professional roofing contractors: Roof materials are measured by the "square," with one square equal to 100 square feet. Roofing squares are further broken down into 3 bundles each. When you hire a contractor to install a new roof, he or she will estimate how many squares are needed, allowing 10 to 15 percent extra to account for waste, cutting to fit your roof's individual quirks, like hips and valleys, chimneys, and other features. Often there will be shingles left over. Depending on your agreement with the contractor, you may end up with a spare bundle or two on your hands. What to do with them? Here's help. Save at least one bundle of shingles for repairs. Even the best roofing job might be damaged someday by ice dams or severe storms. This way, you'll be sure to have matching shingles -- even if the supplier no longer carries your style or color in 5 or 10 years. Just be sure to store them under the correct conditions. Like the perfect bowl of porridge, their temperature should be neither too hot (they can soften) nor too cold (which can also damage them, as well as making their adhesive strip less effective), and the shingles must be protected against extremes of moisture. 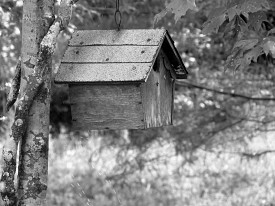 Use leftover shingles as a sturdy roofing material for smaller projects such as covering a shed, gazebo, doghouse, birdhouse, or fairy cottage. You may not care about matching the color or design of the shingles if your outbuilding is in some hidden corner of your property. Should it be visible from the street, though, coordinating its roofing to the roof of your home is a cute look that attracts attention and adds curb appeal. Set a row of asphalt roofing shingles on your front walkway when it ices up in wintertime. The rough surface of the shingles will give traction and eliminate the risk of dangerous slips and skids. At the same time, by not sprinkling briny deicing compounds, you will avoid salt damage to your concrete ... and to your expensive new boots. Prepare the ground by setting down an under layer of asphalt shingles before you construct stonework like a backyard terrace or garden path. This will keep your stones or pavers from shifting out of place and stop weeds from sprouting up between them. Add flair indoors with cool natural slate or wooden roofing shingles such as cedar. Depending on how many shingles you may have on hand, try assembling them as a stylish accent wall, an eye-catching mural, or a unique piece of wall art. Painting or staining is optional. Substitute wood shingles for canvas when you oil paint, to give an attractively rustic air to your pictures. Before you unleash your inner artist, coat the shingles on both sides with matte acrylic to preserve the natural color of the shingles and prevent them warping. Create one of the most fascinating cooking utensils we've ever heard of. (CAUTION: This project is safe only with cedar roofing which has not been chemically treated.) Check your shingles for splinters and sand lightly if necessary. Wet shingles prior to using them as a base for planked salmon, other fish, or vegetables on your grill. You and your guests will enjoy a meltingly moist, delicately smoke-flavored gourmet dinner.